Growing up in the suburbs, I never had much time to walk through rustic gardens or have adventures in the forest. Aside from ice skating, I wasn't one for winter outdoor activities. Although I did go hiking on occasion and once had the pleasure of walking through the woods in the West of France. During the magical walk I remember the absolute quiet, and sheer sense of peace I could feel right through my core. Even though I didn't have many wintertime garden experiences, I still managed to cozy up with warm drinks and inhale the aroma of spices slowly baking in the oven on chilly afternoons. I'll never forget the comfort of sitting in a warm house under a fuzzy blanket while letting a warm drink flood my senses with peace. 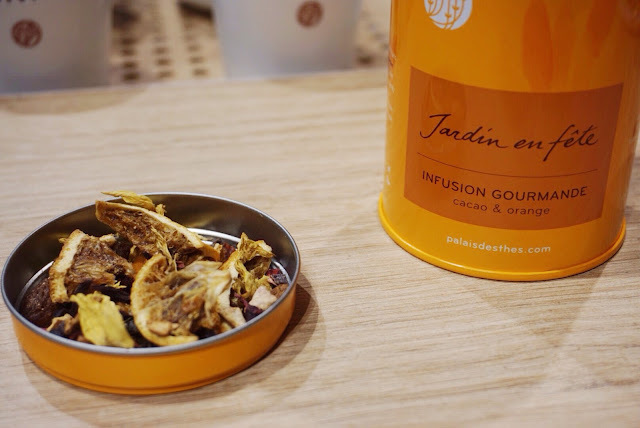 This feeling of comfort is what Palais des Thés is hoping to convey with their new line of Winter Garden teas. Warmth, nostalgia, and of course delicious flavor. I'm always skeptical of tisanes (Palais des Thés refers to tisanes as infusions), since I'm not a fan of many herbal teas. They're too mellow, too floral, too...not tea. So I went in to the tasting with some skepticism. 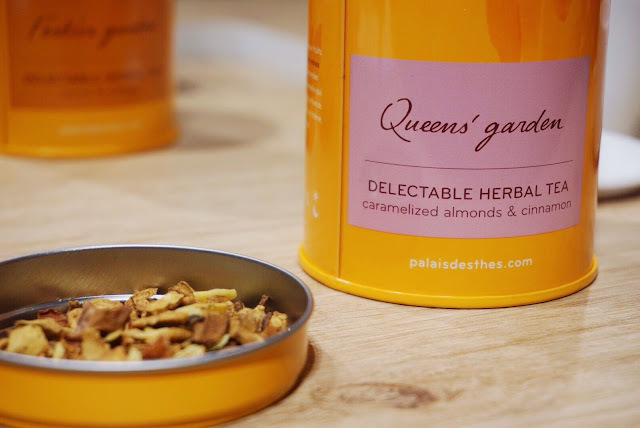 Palais des Thés has many specialized infusion blends, which are created with health and flavor in mind. The General Manager of the store welcomed us and we dove in to the three different teas. 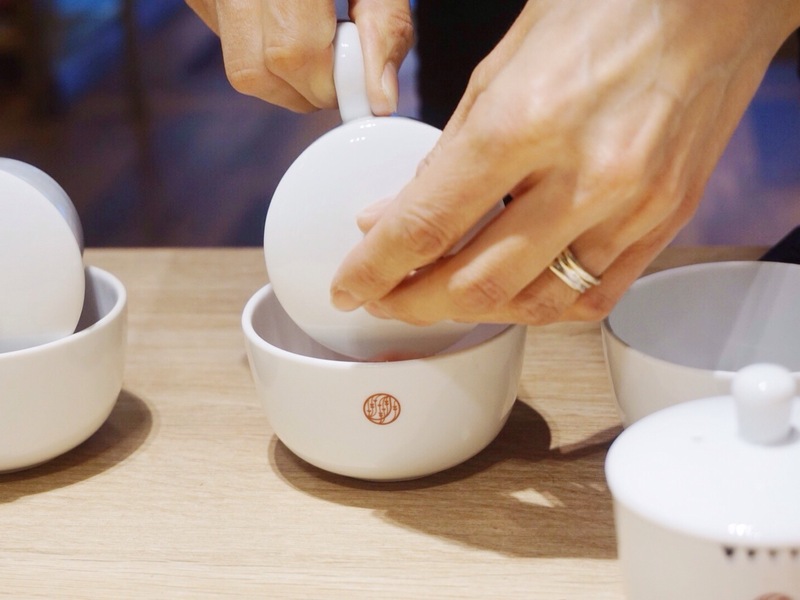 The first we tried was the Forest Garden tea. This tea is packed with fruits and berries. It has a deep red color. It was juicy, tart, yet earthy. I could taste currents, blackberries, and apple, which gave sweetness and a robust berry flavor. The earthiness was from the beets, which not only lent flavor but also added a beautiful color. The infusion also contains elderberry which is a deep berry flavor and is also supposed to be helpful to fight colds during winter months. I don't like to discuss the health benefits of tea, but I have read quite a bit about elderberry. I enjoyed this tea, and had the idea to add a little of the infusion to my cranberry sauce for Thanksgiving. I think the intense berry flavor would pair well with the tart cranberries and sweet citrus that I use in the sauce. The second tea was Festive Garden. I noticed this tea had huge pieces of citrus and I was a bit hesitant to try it. I enjoy citrus, but only in subtle amounts in tea. I admit I was enticed by the aroma, because it has strong chocolate notes along with the citrus. When I tasted the brew, I was happy the bits of cocoa, apples, and grapes rounded out the citrus flavor. It reminded me a bit of chocolate covered orange peel. This would be a lovely tea to serve during the holidays along with chocolate desserts. It would also make an interesting addition to a sweet sauce. Our final tea was Queens Garden. This one intrigued and puzzle me the most. It has big pieces of apples, almonds, and cinnamon. I've never had actual nuts in tea before, and I wasn't sure if I'd like it. The aroma smelled like an apple pie- apples, cinnamon and sweetness. I was quite taken with the brew- it tasted like apple pie filling. Sweet apples, spicy cinnamon, and a nice earthy almond flavor. It reminded me of those lazy snow days, warming up and inhaling the apple pie baking in the oven. My grandmother used to make stewed apples, and this aroma reminded me of that as well. This tea brought me many happy nostalgic memories. It is a nice tea to drink after dinner in lieu of dessert. I'd also be interested to try brewing it with hot apple cider. Maybe add a shot of brandy. I admit, I enjoyed these herbal teas much more than I was expecting to. I was surprised at how much flavor was in the cup. 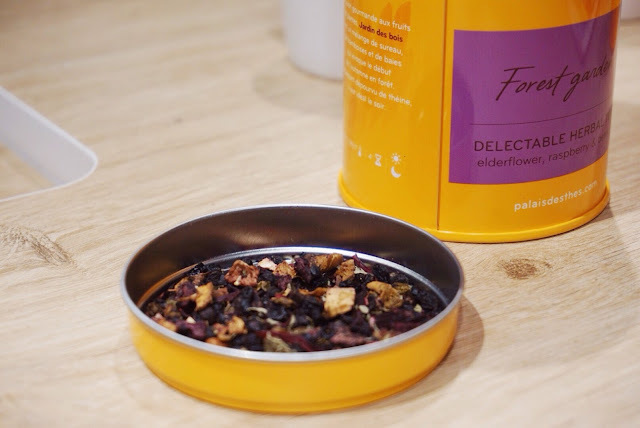 With all of these festive flavors, the teas would make a nice holiday gift.